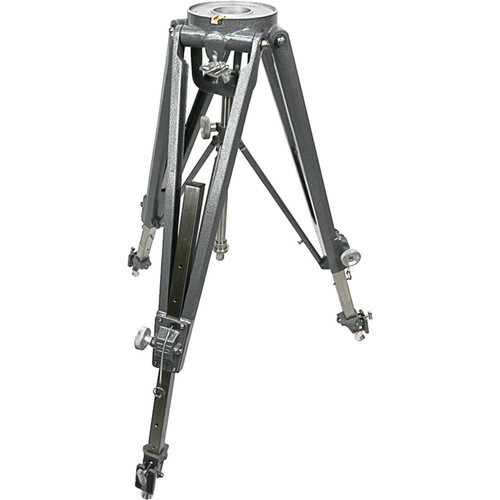 The MT-1 Heavy Duty Tripod from Matthews is used for location videography with heavy camera and lens packages (sold separately). Nearly every sports remote broadcast including auto racing, baseball, football, and wrestling depends on the MT-1 for the firm, stable platform required for whip pans and other rapid camera movements with no tripod jitter, twist, or swaying. Camera mobility can be achieved by mounting the MT-1 to the Doorway Dolly for either track or surface running. Leveling the MT-1 has been simplified by placing the leveling bubble in the center post. The MT-1 also offers an improved braking system, furthering its handling and stabilizing capabilities. It supports a load capacity of 265lb and an operating range of 25" to 44".